The saw you see at the left is a very pristine example of an early production D23. 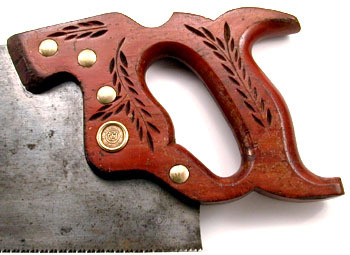 Saws like this were only made for about 17 years before the entire line was redesigned in 1928. The saw pictured is a 26" 6 ppi cross cut. It measures a full 6" at the heel, and 1 1/2" at the toe. The handle on the early D23 is radically different than those on post 1928 models. 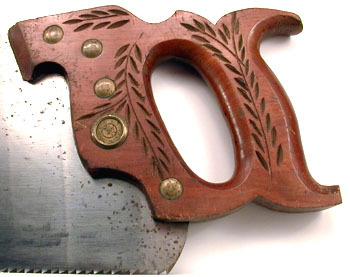 Like all Disston's saws that were redesigned in 1928, the earlier models have more fully carved handles, more graceful wheat carving, and a higher degree of fit and finish. The handle on all D23s, except those of very late production, were made of apple. Compare the handle on the early D23 to one made only about 15 years later. The etch on this early D23 is very similar to that of the D8. Shown here for completeness.